Investing is for a large part looking into the future. We don’t have a crystal ball, but we do have trends. As an entrepreneur, futurist and investor, I do see some evolutions in the market that can put the big brands in trouble. That threat will come from the small entrepreneur. The Coca-Colas, the Heinz ketchups, Kellogs. They used to rule the isles of the supermarkets. It was very hard for any competitor to take some market share. Today big brands still are holding a very strong position. But I think that may change soon. The biggest threat will come from small entrepreneurs that will launch very targeted niche products. Here are the trends, that I think will put a dent in the monopoly of the big boys. Launching a new product or brand, before Amazon existed. Your only option was to get into stores. But shelf space was very limited and only reserved for the well-known brands. Amazon gives small brands the opportunity to get in front of potential customers. Shelf space is virtual and abundant. With the acquisition of Wholefoods, you will see the integration of Amazon products and services in the physical store. Small niche brands that do well online will get on the shelf in the brick and mortar stores more easily. In the near future, you will see more competitors with quality products next to the famous brands in your department store. Just research “ketchup” on Amazon. 49 result pages with a range of products from truffle ketchup, fruit ketchup, no sugar ketchup, whatever. The lean distribution by Amazon makes it possible for these niche brands to be profitable. Big brands dominated TV advertising. That is how they have built their empires. TV was the only mass media outlet. It was expensive. If you wanted to compete with a new product, you better have a big war chest. But with the rise of Google, Facebook and other forms of online advertising, it is easier and more affordable than ever to reach your target audience. You can even sell direct, so you don’t have to give up a margin to a department store. Coca-Cola is the perfect example how a brand keeps its strong position by having a very strong distribution position. There is always a Coca-Cola vending machine, bar or selling point nearby. They have partnership deals in place and are present at most big events. Accessibility to the product is key for success. This strong distribution model will be hard to break. But new forms of delivery can make it very convenient for customers to switch brands. 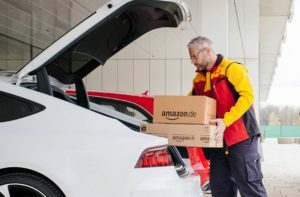 Today there are already deliveries in the trunk of your car. Going to the grocery store and carry heavy liquids may be a thing of the past soon. Drone deliveries, self-driving delivery trucks, they all seem like stuff from the future. But they are coming, and they will impact the way how and what we consume. Toys R us is a first big brand that fell victim to the new distribution trend. Yes, they did have a big debt burden to carry. But other distribution channels like Wallmart online and offline, Amazon and various other online outlets had put more pressure on the margins which ultimately meant the end of Toys R us. Changes in distribution models will change our consumption behaviour. A decade ago it was far more difficult to get your product made. You needed a production facility, a factory. There were contract manufacturers, but they were much harder to find. Today, with a few clicks, you can find a contract manufacturing, private label solution, or a manufacturer in China thru Alibaba. The internet has facilitated accessibility to production. But new production methods are making it easier to get into a new market too. 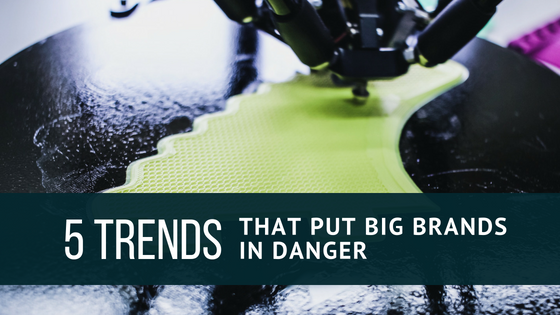 3D printing and robotics will make it possible to produce on demand. Making an investment in a large stock and warehouse obsolete. Michael Jordan and Nike were a match made in heaven. Jordan has the audience, Nike has the production and distribution facility. But in the future, will celebrities still collaborate with big brands? What is the incentive? If celebs can 3D print their shoes and sell them directly online to their massive social media following. Why would they need Nike? There is no risk of holding a stock. Quality? With customer reviews, this is not relevant anymore. You can already see this trend manifesting with merchandise. With services like Printful, Merchify, or Merch by Amazon, you can create a fan store with 0 stock. Everything is printed on demand. From T-shirts, Coffee Mugs, Posters and so on. As technology advances, these services will provide a bigger choice of products and customizations. Artificial intelligence is definitely going to change the way we consume. Today we use comparison and review sites to research a purchase. In the future our personal AI shopper will determine what is the perfect product for our individual needs. The AI will advise us on more objective reasoning to decide on which product is best for you. A brand will mostly be a status symbol. Brands will always be around. But new technologies will change the way how we consume brands. Especially Brands in the Low-tech industry will have a hard time. Just having a catchy name and logo will not be enough anymore. A brand will need substance in the form of uniqueness, patents, technology or user experience. Competitive advantages from the past like distribution, production and advertising budgets will be less relevant.